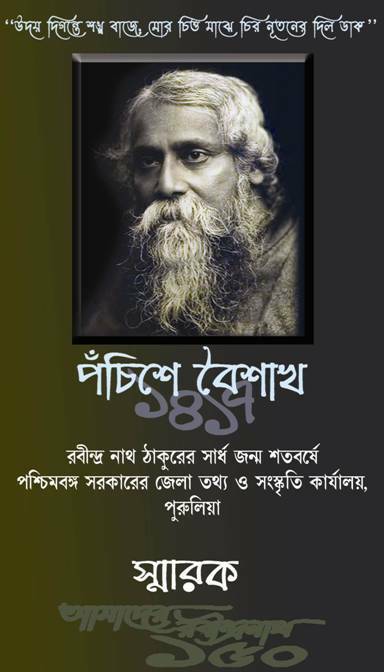 Born in May 1861, Tagore was one of the greatest poets, a novelist, a musician, a playwright and social reformer world ever saw. He was awarded Nobel prize in literature for “Gitanjali” in 1913. The occasion of Rabindra Jayanti is celebrated at Purulia under the auspices of the District Information & Cultural Office & Sub Divisional Information & Cultural Office, Raghunathpur. This year is even more special since it is the 150th anniversary of his birth. At Purulia town, on the 9th May 2010, a number of teams from educational institutions and cultural organizations took part at the main function at Purulia Zilla Parishad Conference Hall. Shri Jayanta Kumar Aikat, the Additional District Magistrate (Development) paid tribute to the poet on behalf of the district administration. At Raghunathpur, a procession comprising of the members of educational as well as cultural organizations took part at “Pravat Feri” (Morning Procession) & cultural function.